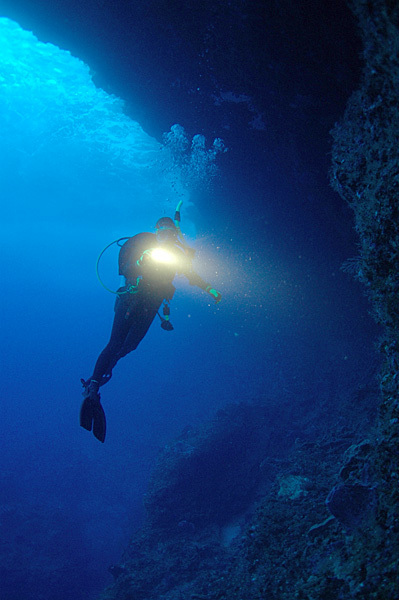 An overseas dive trip is a big investment in time, money and effort, so you want it to run smoothly. You will enhance your enjoyment, and reduce unpleasant surprises if you take a little time to prepare. Do they have O2 available on all their dive boats? Can their O2 equipment give high concentration oxygen to a breathing and non-breathing diver? How many hours O2 supply do they have? Is it enough to get the diver to appropriate medical care? Is their staff trained in O2 first aid? Do they have a first aid kit on board all boats? Do they have an Emergency Plan? What type of diving is offered? What depths are offered? Do you need any special gear? Are long boat trips required? What thermal protection, if any, do you need? Know what to bring, and what will be supplied. Make a list. Write down serial numbers. Label all gear, either with a tag, or with a permanent waterproof marker. Pack all gear into a sturdy bag, and buy a TSA compliant combination lock. Get your gear professionally serviced well before your trip. Inspect mask and fin straps for wear, and replace if there is any doubt. Some regular swimming, walking, or any regular physical activity will pay off. Attend to any nagging medical issues that could flare up during your trip. Get that dodgy tooth seen to before you travel. If it’s been a long time since you last dived, get back in the water for a refresher dive or two, to check your gear, and your skills. Include both first aid and a few “save a dive” spares. For first aid, include a pressure bandage, wound dressings, antibiotic cream, over the counter painkillers, anti-diarrheal medications, sunscreen and aqua ear. Save a dive spares can include 0-rings, lubricant, fin and mask strap, cable ties, and a spare computer battery. Pack everything in a watertight plastic box, so you can take it with you on the dive boat. One of the most frequent challenges faced by DAN is dealing with incorrect phone numbers. All it takes is for one digit in a call-back number to be wrong to prevent DAN from reaching a diver and delays to ensue. Should you call a DAN Emergency Hotline you will quickly be asked for a number we can call you back on, just in case the call drop-outs or is disconnected, which happens often as phone connections in many parts of Asia, the Pacific, and the world, can be unreliable. Make sure you always have this lifeline number on-hand: +61-8-8212 9242 (from outside Australia) or 1800-088 200 (toll free within Australia). Note: Whilst all divers can call DAN for advice, DAN can only arrange an Emergency Evacuation and pay for associated treatment costs for current Members (within the limits of their coverage option). Don’t leave home without it. DAN are the experts in diving accident management and you definitely want DAN to be there for you should you need it (danap.org). 1 YEAR DAN Asia-Pacific Membership + 1 YEAR Subscription to Scuba Diver AUSTRALASIA + OCEAN PLANET Want to get your hands on this package? Click here.